I would like to share with you a link to a truly glorious archive on Wiki Commons, but first some information about the artist. 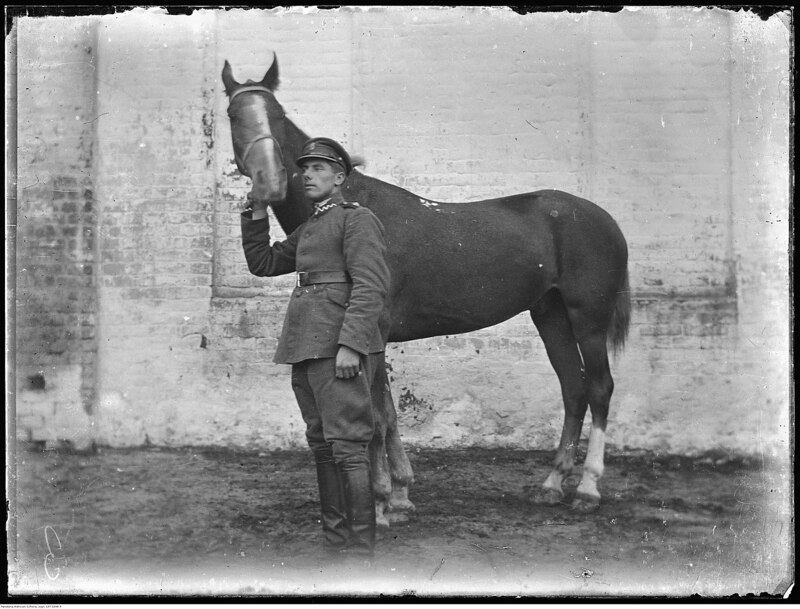 the author of these photos was Narcyz Witczak-Witaczynski who was a career Polish soldier and a popular photographer of Polish world between the wars, especially of Polish cavalry. so born in Warsaw in 1898, in 1915 and being only 17 years old he run away from home to join the uhlans of Polawy Legion, then a part of the Russian Imperial Army. The Pulawy Legion uhlans were converted into the 1st uhlan regiment in April 1917, and continued fighting on the Russia's western front against the Germans and increasingly against the marauding Russian army deserters and communists and banditry. They fought the famous and nowadays forgotten battle of Krechowce near Stanislawow (present day Ukraine) on July 24, 1917. For his actions at Krechowce young uhlan Narcyz was awarded a silver cross of Virtuti Militari (in 1921). In Septemebr 1917 the regiment became a part of the First Korpus Polski under general Dowbor-Musnicki and engaged in fighting the communists and protecting the countryside, which led to fighting against the Bolsheviks after the October Revolution. In May 1918 upon the Treaty of Brest-Litovsk and especially under the pressure from the German Army the Korpus Polski was disbanded and soldiers were left to fend for themselves. Young Narcyz was captured and arrested by the Bolsheviks and forced into a Bolshevik cavalry unit known as Masovian Regiment of Red Uhlans, where in fighting near Kazan he was wounded while trying to cross over to the other side. When his Red Ulans unit was disbanded he was mustered into the 1st Latvian Cavalry Regiment (Red Army), He run away near Riga but was captured and held in Mitawa (Jelgava) by the Bolsheviks until the city was taken by the German army and he became a prisoner of war of the Germans. Sent to Frankfur on Oder River as a prisoner/deportee he run away and returned to Poland in July 1919. 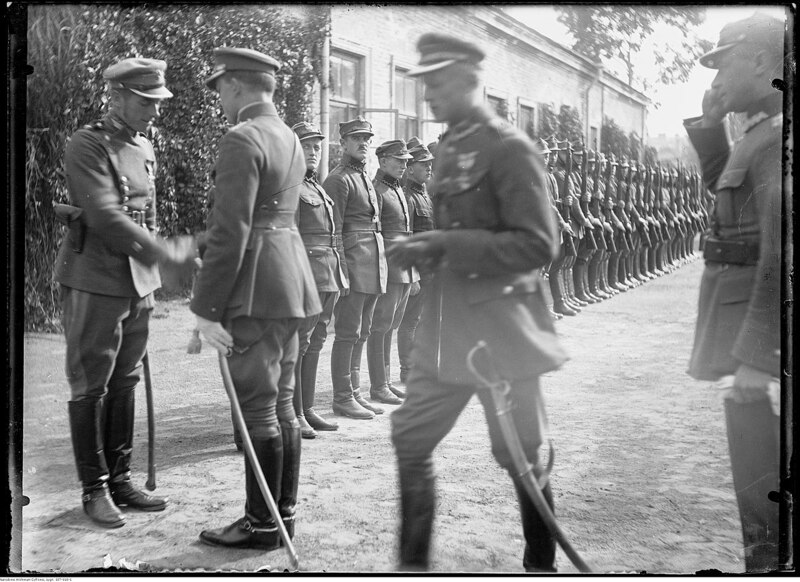 On July 22, 1919 he returned to the Polish military, joining the 1st Uhlan Regimen (Krechowiecki). From there he was ordered to the Szwadron Przyboczny Naczelnika Państwa ( Chief of State Guard Squadron). He campaigned in the Ukrainian front of the Polish-Bolshevik war in 1920 and after the war continued to serve in the Guard squadron until its dissolution in 1926 upon the May Coup d'Etat by Pilsudski. Then he was order to the NCO school, worked for the Ministy of Military Affairs and eventually in 1928 he returned to serve in the 1 Pułk Szwoleżerów Józefa Piłsudskiego (1st Regiment of Lancers of Jozef Pilsudski), where this regiment served as a de facto guard unit to the head of state. In September 1931 he was ordered to the 1 Pułk Strzelców Konnych (1st Regiment of Chasseur a Cheval ) where he was stationed until the beginning of the World War II. 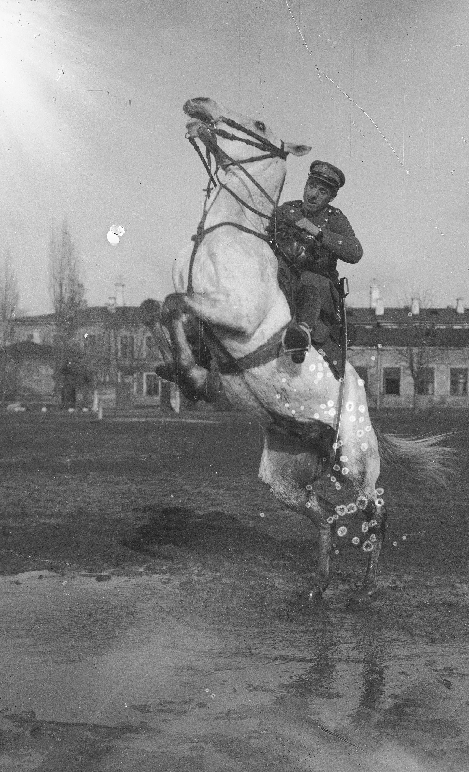 As a chorazy he drove along with the his chasseur a cheval regiment to fight during the September invasion of Poland (1939) ( the chasseurs dismounted their horses for the last time in June '39 and were turned into motorized 'cavalry' and became part of the Warszawska Brygada Pancerno-Motorowa during that summer of 1939) and shared the fortunes and misfortunes of his unit that ended destroyed during the fighting around Tomaszow Lubelski. It was a sad war, mostly because with an able army and spirited population (although about a third of the 35 million of Polish citizen were minorities rather more than less estranged from the Polish state) the dictatorial government consisting of top officers of the Polish military mixed with some civilian leadership had been duped into an empty, paper-only alliance with Britain and even more droll one with France in the Spring of 1939 that promptly led to a solitary war with Hitler's Germany and Hitler-allied Stalin's Soviet invasion of Poland (respectively on September 1 and September 17), thus a complete obliteration of the 2nd Polish Republic and her elites between the fall of 1939 and Soviet Conquest 1944-45. Pan Narcyz, returning from the war to his town of Garwolin in the fall 1939, joined the underground armed struggle against the Germans, run the counterintelligence unit of the local chapter of the Union of Armed Struggle and Home Army, was arrested by the Germans in July 1942, held at the Pawiak notorious and heinous German prison, and then the Germans murdered him in Majdanek on March 27, 1943. He was an photographer since 1919, eventually became known for his art in the army and outside, and was one the few who were being allowed to photograph Jozef Pilsudski. His photographs appeared in numerous magazines like 'Wiarus,' Jedziec i Hodowca,' Polska Zbrojna & Ilustrowany Kurier Codzienny. Today, almost 5000 [sic!] of his photos are available at wiki commons and National Digital Archive of Polish Republic (NAC). They were given to NAC by pan Narcyz' grandson Jerzy Witczak and great grandson Rafal Rekawek in 2014.